I am miffed at missing so many cool events last weekend, most notably PodCamp Perth. I guess I’ll just have to live vicariously through Flickr. I had been hoping that with discussion of firebrand union bosses and the question of ratifying Kyoto making headlines over the weekend, The Economy ™ might have stayed in the shadows for a few days more. I was wrong. I’m hesistant to call the election outcome, but the way the Liberal Party is clinging to “low interest rates! strong economy!” at the expense of other messages does have me wondering. Remember the one-vote-one-value arguments shortly after the State election in 2005? Yesterday the WAEC released new electorate boundaries based on the changed laws, with one MP per 21-ish thousand voters. Basically, there’s a few more metro seats (e.g. Mount Lawley) and a few less rural seats (e.g. lumping Esperance and Boulder into Eyre). There were reports yesterday of panic within the Liberal and National party rooms about who’ll be preselected where, but I have to say the new boundaries look sensible, and contrary to early sky-is-falling claims the Mining and Pastoral seats are no more huge than they used to be. And with both conservative parties still incapable of showing any competence, with or without these changes they ain’t looking good for 2009. And finally, Federal Labor have taken their photocopiers to last week’s announcement by John Howard of money for highway upgrades around Perth, throwing in an extra $200m for good measure. For proof that these announcements are no more than pork-barrelling, consider that neither major party has promised serious money to railways or seaports, anywhere. It’s annual report season, which means there are even more documents vying for my attention than normal. 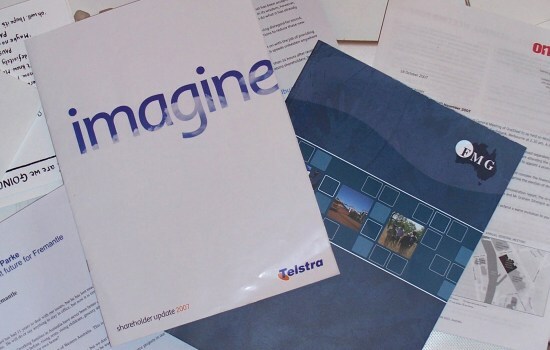 Telstra’s one, pictured, reads very much like that of a company slightly stunned as its industry changes around it, and is basically one big whinge at the regulations laid down by the Federal Government. 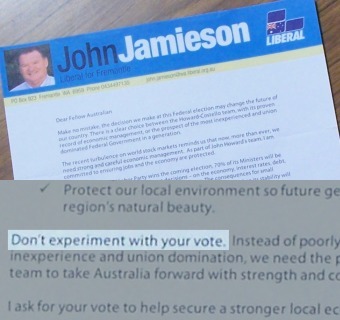 So much so that I’m surprised they haven’t started running ads urging people to not vote Liberal. The machinery of the WA public sector is also busily churning out reports, some of which have thrown up headline-worthy allegations. The biggest was last week from the Information Commissioner, an anti-corruption office set up in the 90s, whose foreword complains of being screwed around by the Attorney-General. This gave ripe pickings for a new round of swipes at Jim McGinty — for a while, at least. There was also news of enormous shortfalls in the budget for the local Flying Doctor branch, and corruption problems in the Health Department; cue more swipes at Jim McGinty. Collectively, these revelations are not a good look for the Carpenter Government, but with all eyes on Federal matters (why do the papers care so much about a TV debate?) they’re having no trouble getting away with it. Since it’s become mildly fashionable among newspapers and bloggers to make a statement of neutrality during election campaigns, now that we finally have a date, I thought I’d jump in with one of my own.